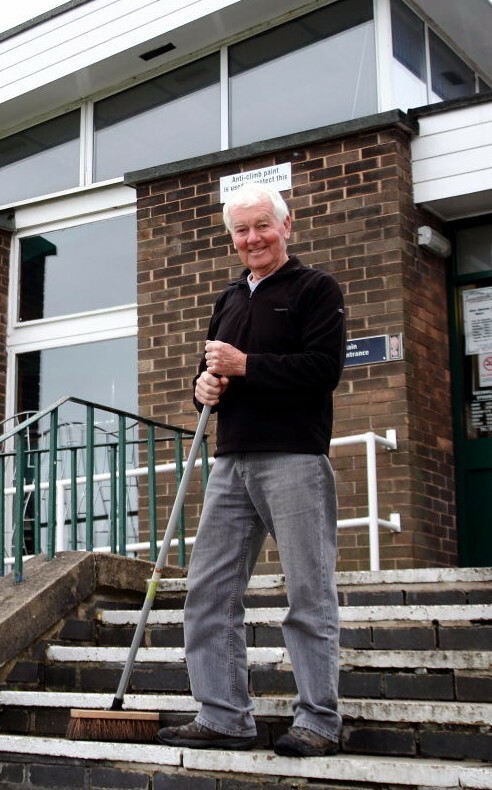 When he’s not waging war on weeds, Mick, who has always lived in the Greenhill and Bradway areas, is tackling take-away food and packaging dropped by people hanging around outside the library, along with disposable forks and cigarette ends. The most unpleasant thing he finds is dog mess, but thankfully, he adds, it’s not a common problem. Retired high voltage engineer Mick says that he has always used the Library, admitting that he would sometimes grumble to then staff about the steps which were “always a mess”. When the volunteers took over, he says: “I thought the least I could do is the bit I complained about most!” Now he’s about to embark on the ‘hardest part of the job’ tackling the leaves which will fall between now and December. Last year, he recalls, he filled eight huge sacks. “I get satisfaction from ‘doing a bit’. I think the whole concept is brilliant, and the it’s amazing the number of volunteers who have come forward to keep this place going, it’s a major achievement. It’s nice to be part of it. Popular reading group Chatterbooks has started a new chapter this autumn, with library volunteer Clive Opie now organising the club. Children and parents already attending the group for 8 – 11-year-olds, which meets on Mondays at Greenhill Library, will already be familiar with Clive, who has assisted with the mix of book-based activities since last year. Having taken over in mid-September, he’s exploring new ways to keep Chatterbooks lively. 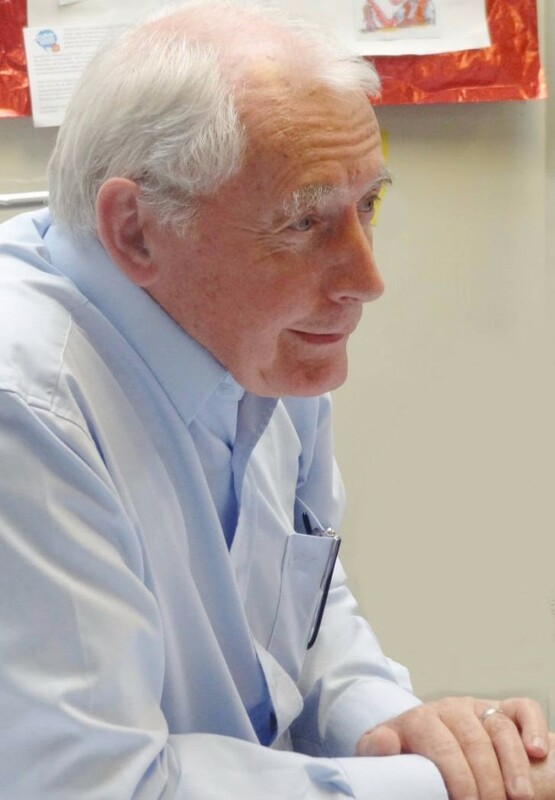 Originally from Devon, Clive has lived in Sheffield since the 1970s when he was an undergraduate, and then PhD student in Chemistry at Sheffield University. Always intending to teach, Clive worked for eight years at Firth Park and King Ecgbert secondary schools, before taking a variety of teaching and management roles in further and higher education. He moved to Greenhill in 1985 where his children attended Greenhill Primary School. Now semi-retired, he’s bringing his experiences in education to Chatterbooks, as well as his fiddle playing. ‘I can get people dancing’, said Clive,’but I am still a novice and have still so much to learn.’ He is fortunate to sit in to play ceilidh music with the ‘exceptional’ Bash Street Band, and recalls how one Chatterbooks session turned tuneful. Future ideas include creating displays, inviting members to share special interests through mini-presentations, and reading a book together with each member given the chance to ‘tell’ part of the story. Clive’s background means he values the importance of reading, which ‘fires the imagination’, he said. ‘Books can help people to widen their knowledge, improve their vocabulary, and enhance their creativity. There’s also a lot of fun to be had reading books, as the present Roald Dahl celebrations show.’ Although he was not an avid reader when he was younger, although J. R. R. Tolkien was a favourite, Clive enjoys murder mysteries and novels by Sebastian Faulks. Whatever you’re reading, he said, has the potential to act as a voyage of discovery. Maureen Taylor is a woman with a past; one she intends to bring to life at Greenhill Library on Friday, 19th August when, with a swish of her sumptuous skirts, she will showcase the art of dressing during the Elizabethan age. Dronfield Woodhouse resident Maureen brings together her talent for sewing and love of history in a talk which opens the door on the Elizabethan wardrobe, demonstrating how to dress as a Tudor lady while guiding her audience through the social messages which are shot through the silks. 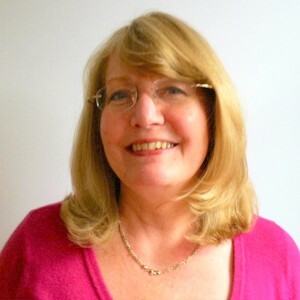 “First and foremost, I’m an historian, and I specialise in 15th and 16th century social history” said Maureen, a Heritage Consultant who holds a master’s degree in History and Heritage Management. Her knowledge of the period makes her well-placed to explain not only the complexities of dressing, but the social cues which informed garment choices. Clothing during this turbulent period informed others of your social status and also your profession, and typically it was the nobility and gentry who were permitted to swathe themselves in the most desirable materials. Fabric marked you out as somebody, explained Maureen over coffee at the Dronfield Hall Barn where she is a trustee. Hence the rich tapestries found in stately homes such as Derbyshire’s Hardwick Hall. “In the home you wouldn’t show your wealth just through furniture, you’d show it through textiles on your walls. And you showed your wealth on your back”. Maureen’s passion for very retro fashion began during an O’ Level project 50 years ago, when she studied what were known as ‘sumptuary laws’ which governed what the population could wear. To step outside your status and dress as someone of higher rank was a punishable offence, she told me. Her interest in history, however, dates back even further to her early childhood, and the books that her mother would buy her for birthday and Christmas presents. Entertaining is just the word to describe Maureen’s upcoming talk, An Elizabethan Wardrobe Revealed, which she will give in full, self-sewn costume, with some changes along the way. Maureen begins her talk in one costume, closing it in another from the end of Elizabeth I’s reign. During the talk she explains the different layers which constitute the elaborate outfits, and how and why they were worn. A further 10 to 12 costumes for men, women and children will also be on display during the event, and discussed with plenty of period detail plus a dash of humour too. Yet while the Elizabethan gentry had the pick of the best cloth, Maureen finds her material in more down to earth settings; charity shops, fabric wholesalers, and even Ikea where a pair of curtains provided the inspiration she needed to create an over-gown and mantle in a deep rose colour. The curtain tie-backs made the shoulder wings of the outfit, which will be there to admire at her talk. Her dresses are created around a basic pattern from the United States, and adapted using original sources such as portraits to customise the clothing. It’s not a cheap pastime, she said, in terms of fabric or the hours she puts in to her spectacular creations. A dress styled after one worn by Elizabeth I cost around £150 in material. Factor in the three months Maureen spent crafting it, however, and the garment has cost her approximately £1,000. 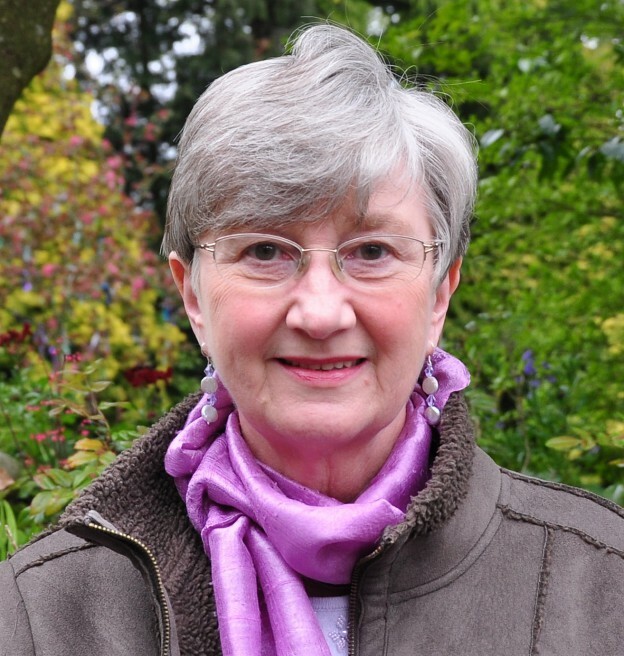 Multi-talented Maureen has also recently penned a novelette about the Lady of the Manor behind the building of Dronfield Hall Barn, and ‘Alice Deincourt: Her Story” should arrive on the shelves by Christmas this year, with all profits going to the Barn’s gardens. And while she may have one foot in the past, Maureen’s future looks likely to feature more of her favourite thing: learning. . “I just like learning” she smiled. “The day I stop learning is the day I go gaga, or they put me in a box”. You can see Maureen’s marvellous creations on 19th August at Greenhill Library. The talk starts at 7pm and entry costs £5, with all profits going to support our local library. Tickets are available from Greenhill Library or on the door on the evening. Irene Davy was a junior assistant at the library when it opened. Cath Bannister went to hear her story. Greenhill Library is a great community resource, which has recently escaped closure thanks to the hard work of our dedicated volunteers. However, it seems that the library’s original opening was fraught with peril too, as its initial staff members faced up to severe snowfalls, a boiler breakdown which threatened the brand new books, and even the possibility of nuclear war! I met up with one of Greenhill Library’s first library assistants, Irene Davy, who is now 70 and living in Crookes. She filled me in on those fraught – but fun – months of preparation before our library opened its doors in February 1963. A radio brought into the office was also essential listening for a different reason. Hostilities in the ‘Cuban Missile Crisis’ were coming to a head and, as Irene recalled, “we thought it might be the end!” There was much laughter, though as they pondered what they would do if the four minute warning sounded; everything from getting back home to be with their families to buying a luxurious fur coat. Thankfully, the international emergency was resolved. Meanwhile, back in Sheffield, the books bound for Greenhill were transported to our library just before Christmas. There they were stored in the stacks, “but not in the library, fortunately” added Irene, because at that point disaster struck. “On Christmas Day, the boiler blew up,” said Irene, who described how black sooty water came pouring through the vents into the main body of the library and down the walls. Had the books been in place, many could have been badly damaged. The problem was compounded by a severe snowfall on Boxing Day heralding the start of the terrible winter of 1962 – 1963. Despite the lack of heating in the building, staff heroically offered to continue preparing our library, even if its opening had to be delayed, from January to late February. “We volunteered to work there with no heating,” said Irene. “We did it in relay, each of us working two days a week and wearing whatever we wanted to keep warm, even trousers!” This, she remembered, was a real privilege in the days when women were expected to wear skirts or dresses for work. On her allotted days, Irene, who was then living in Meersbrook, would catch a bus to Meadowhead and trudge through the deep snow down through Greenhill village where icicles several feet long hung from the cottages. Bundled up in thick clothing, she and her colleagues made soup and hot drinks in the library kitchen to keep warm while they worked, and also patronised the village chippie. 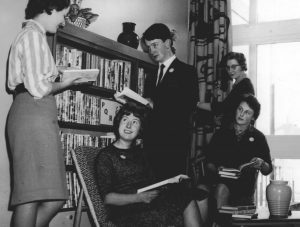 Finally the library was ready, and the staff posed for pictures browsing the books and sitting on the stylish 1960s Ercol chairs. These photographs were published in The Star newspaper alongside a report marking the opening of the library by Sheffield’s Lord Mayor, Alderman P. J. Kirkman. The library was an instant hit with locals and hundreds of people descended on the library to get tickets. “Was it busy!” laughed Irene. “There was just a perpetual queue out of the door for days. We were always on our feet. They just queued and queued. It was exciting, there’s no doubt, it was exciting.” The shifts were long, as the library was open from 10am til 8pm four nights a week, and from 10am until 5pm on Saturdays. Irene, however, remembers it as a happy time and the library as a place where there was always something happening. The children’s library held a film show once a month, as well as regular story time and craft sessions. Adults enjoyed a listening group one night a week when users could bring in their favourite records. “We were very committed indeed” Irene said. The photograph shows Irene Davy (right, by the curtains) with her colleagues (from left to right) Jane Hardy, Beryl Starr, Bruce Bellamy and Marilyn Hasler.